This great Ben Franklin 500 ct poker chip set featurs a free timer dealer button, 2 free decks of cards and a free standard dealer button in an aluminum case. This poker chip set is casino grade and of the highest quality. These poker chips are heavy weight, 14 grams. You can really feel the game when you play with the Ben Franklin poker chips. The chip itself is very soft to ensure an authentic casino feel and sound. You will also receive a free timer dealer button. The timer dealer button is a dealer button with a built in tournament timer. 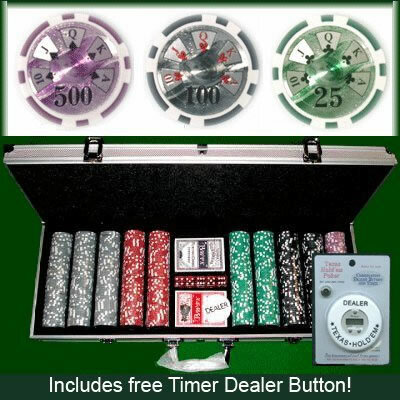 A timer dealer button ensures that every player at the table will know the clock situation. If you're a fan of card games but feel like something other than poker, check out online baccarat tournaments and strategy advice here.